Tippecanoe Valley earned its first win of the season via a lopsided, 36-7 decision over visiting North Miami Friday night. Valley used a 13-point second quarter to jump out to a 22-0 lead at halftime and never looked back. Cameron Parker ran amok for the Vikings with 27 rushes worth 154 yards and a touchdown. He also threw a 50-yard touchdown pass to Jalen Potter in the win. Noah Miller went 5-11-1 through the air with a 19-yard TD completion to Alex Morrison and carried the ball seven times for 71 yards, including a 37-yard touchdown run. Potter hauled in two catches worth 63 yards. Tristan Working threw the ball a whopping 42 times for North Miami, finishing 17-42-3. Braxton Beall made five catches totaling 56 yards, and Darian Hanley caught another five passes for 52 yards. Valley improves to 1-2 and plays its Three Rivers Conference North Division opener at Northfield next week. The Warriors remain winless at 0-3 and play their TRC South Division opener versus Southwood next Friday. NorthWood kept its perfect season alive with a huge win over Concord Friday night, but possibly with a giant cost. Superstar Bronson Yoder was injured late in the second half as NorthWood clung to a one-score lead. An apparent ankle injury had Yoder off the field, and while he returned to the field before the conclusion, his status is up in the air going forward. Yoder scored an insurance touchdown on a 40-yard run with 2:01 left in the game to ice it for the 3-0 Panthers. He had a 23-yard touchdown scamper in the first half and rushed for 187 yards on 29 carries. Where NorthWood made up some major ground on the Minutemen was on the defensive side of the ball, where pick-sixes from Jaden Miller of 58 yards and Kyle Sellers of 72 yards took NorthWood from down 13-9 to up 22-13 in the matter of 90 seconds. Concord had chipped the lead to two at 22-20 when Ethan Cain scored on a one-yard plunge with 11:14 to go. NorthWood will visit Goshen and Concord (1-2, 1-1 NLC) entertains Wawasee next Friday. 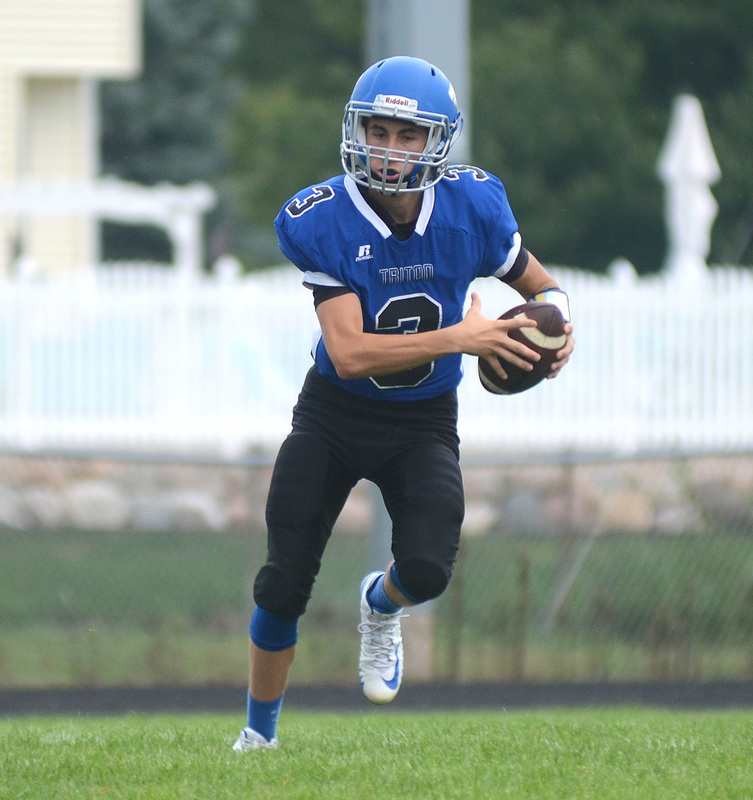 Triton bounced back on the road at Caston with a dominant 57-6 win over the host Comets Friday. The Trojans dropped 24 points in the first period alone and led 39-6 at the half against their Hoosier North Athletic Conference foes. In total, they out-gained Caston 380 yards to 91. Hunter McIntyre finished with 126 rushing yards in only seven carries, while Bo Snyder ran for 64 on three rushes. Snyder went 5 of 8 passing for 87 yards and two touchdowns, and Connor Pitney was 2 for 2 passing for 33 yards and a TD. Tye Orsund finished with two receptions for 79 yards and two scores to lead all receivers, D’Angelo Shumpert made a 21-yard TD reception in the third period, and McIntyre caught two passes for 15 receiving yards. The Trojans finished the night with no turnovers versus two lost fumbles by Caston. Jacob Verdugo led the Triton defense with seven tackles, while Trenton Kreft had four tackles, and Billy Smith and Andrew Parker both finished with three tackles. The Trojans move to 2-1 with a 1-1 HNAC mark. Caston slips to 0-3 and 0-2 in HNAC play. Triton takes a break from conference play at Bremen next week. Caston plays on the road at Pioneer next Friday at 7 p.m.